While plenty of extremely questionable tech patents make it through the US Patent and Trademark Office approval process, a true insight into the horrors that await us comes from looking at patent applications. Herein lies the limbo where a company's mad machinations crash against the leaky dike that's the USPTO. El Reg is always eager to lap up the sad, eerie, and unusual of the bunch as they fall into our sights. We've gathered up a few of our 2009 favorites published in honor of the year's end. Enjoy and despair. Year after year, Big Blue tops the annual list of most patent-happy American tech companies. Which is saying a lot. Judging by some of its applications, we reckon IBM employees have a major problem with being forced to attend endless waves of boring workday meetings. And either they're going to great pains to liven them up, or some of their patent filings are actually coded messages to the outside world for help. 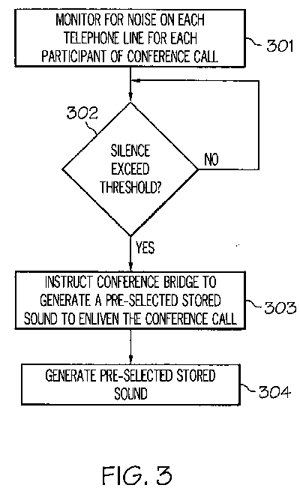 One particularly suspicious application attempts to tackle the issue of "enlivening" dreaded conference calls. The solution - as we're sure brighter minds have already surmised with cold, pure logic - is accomplished through injecting silly sound effects into the conversation. Always appropriate. WAKKA WAKKA HOOOOONK. "It is with great regret that I must tell you our company must lay off approximately 5,000 employees in order to avoid severe financial hardship." CLAP CLAP CLAP CLAP — AWOOOGA! "Damn it, who turned that….? Ahem, we have explored all our options and unfortunately…"
According to the patent: "Meeting attendees will fill the full hour for which the meeting is scheduled regardless of whether the entire hour is necessary to address the business at hand. The result of this is that a meeting that could have taken less than an hour will end up wasting time due to the arbitrary hour-based scheduling paradigm." What's a company to do? Schedule 45-minute meetings instead? Hold fewer meetings? Tell executives not to waste everyone's time? No! Time itself must be redefined! "The observation is that if an hour were shorter, by a small amount, we would be more focused, and accomplish the same amount of work, but in less real time, thereby increasing productivity," the patent application states. 'Christ on a cracker!' you say. 'Has IBM invented a time-compression device?' Alas, no. What we have here is a company trying to claim it has invented scheduling meetings based on non-standard time intervals. And here we thought the minute hand of a watch could do that.